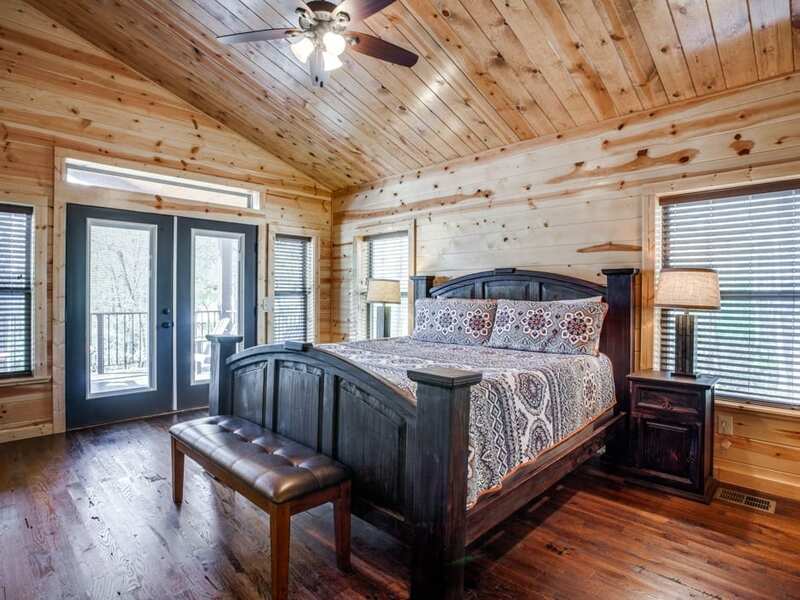 Two master suites each with plush luxurious king beds. 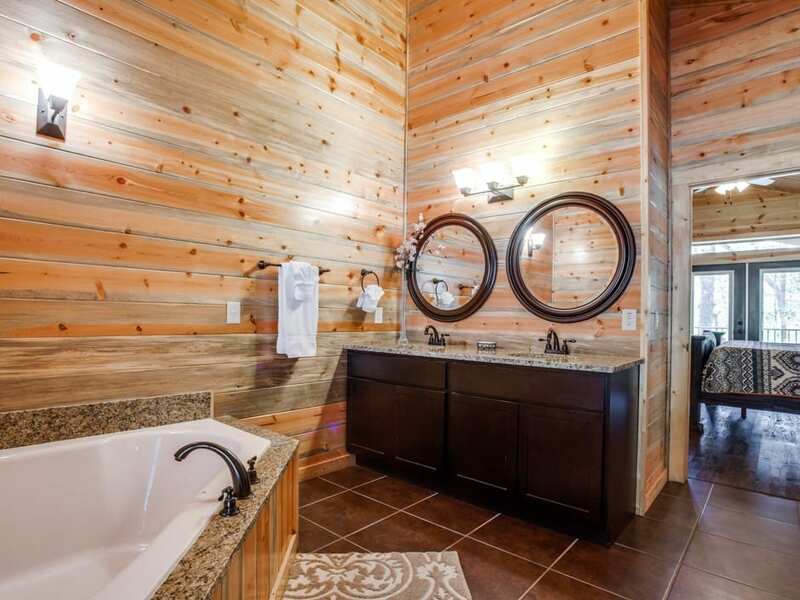 Suite one has a tiled walk shower with seperate soaking tub, suite two has a shower tub combination. 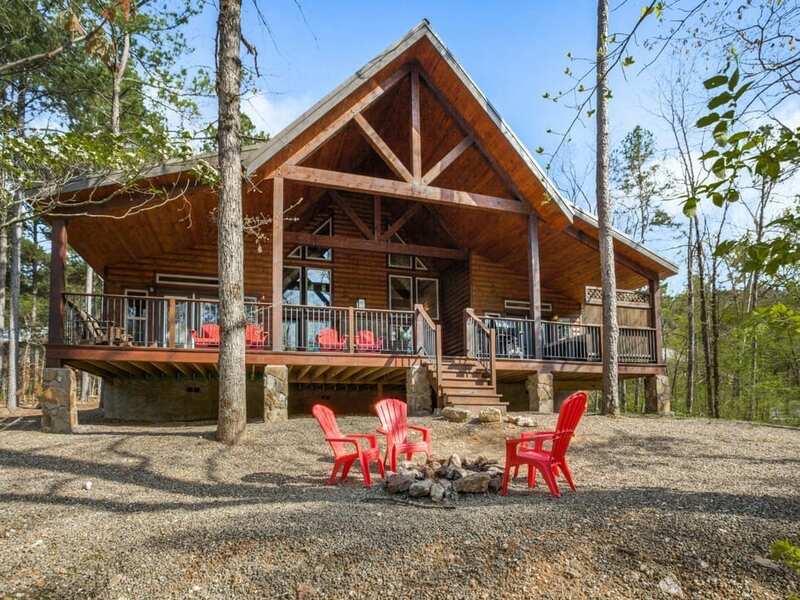 Touch the Clouds is a two bedroom cabin located in Timber Creek Trails South , Phase I. 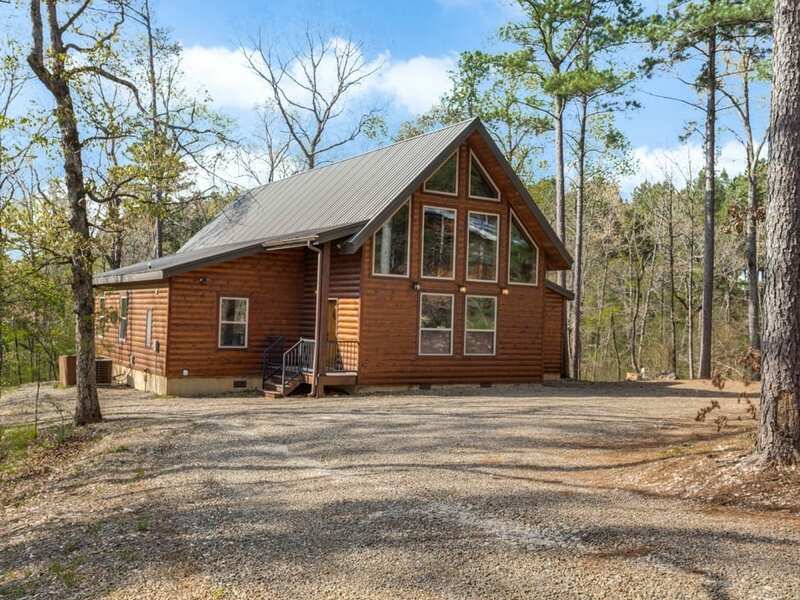 This 2-bedroom cabin offers an open floor plan that provides space to gather in the kitchen while preparing meals or around the fireplace while watching television. 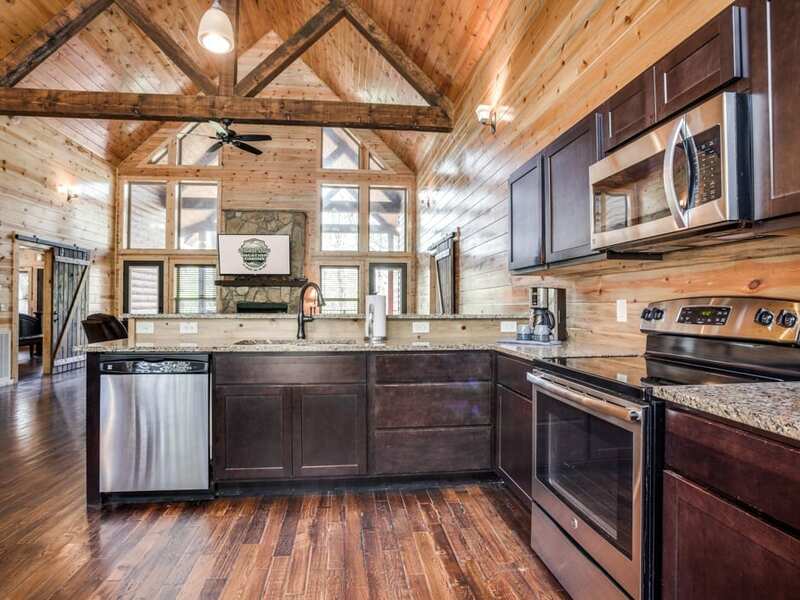 The kitchen has stainless appliances including refrigerator, dishwasher, microwave and glass-top cook stove/oven. 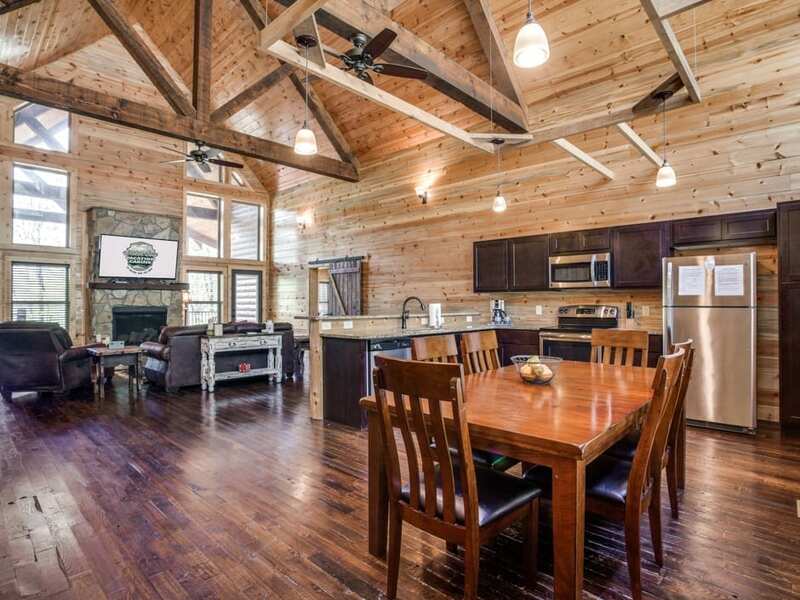 There is a dining table with seating for 6, as well as bar top seating for 4 at the island. 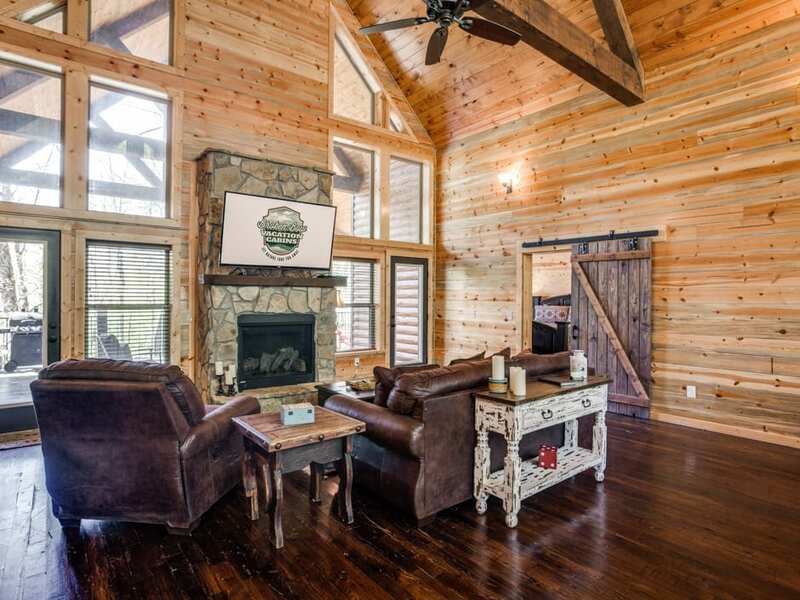 The living area has a gas burning fireplace with a 60″ HDTV flat screen mounted above the mantle. Direct TV package (PPV not available) is streamed throughout the cabin. The sofa converts to a queen sleeper to accommodate 2 guest. 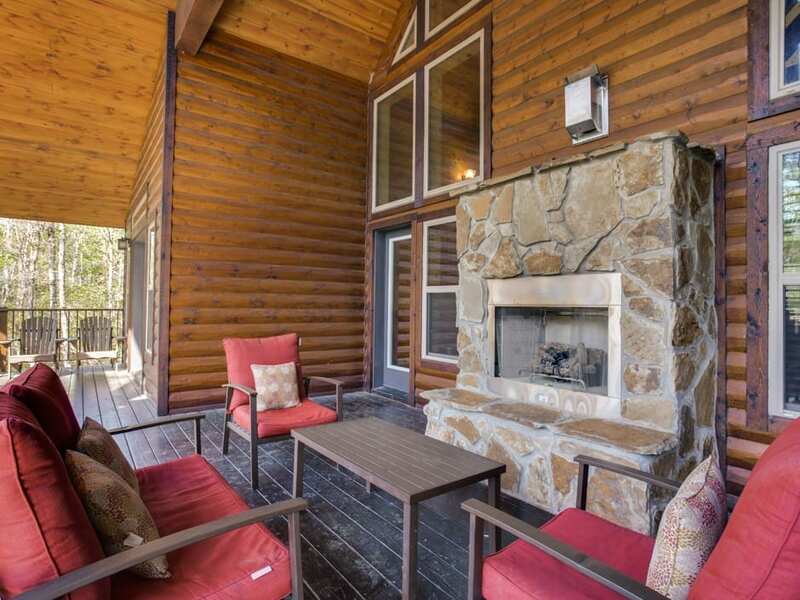 Two doors flank the fireplace allowing access to the back deck from the living area. The Master suite is to the right of the living area. 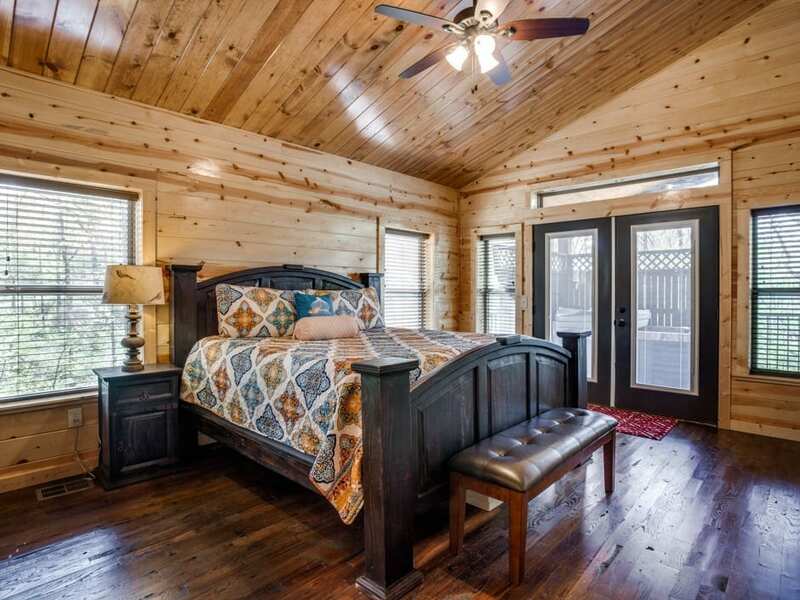 The large Rustic style wood bed is wrapped in luxury linens. A 60″ HDTV is mounted on the wall for night time viewing. There are French doors leading to the back deck area. 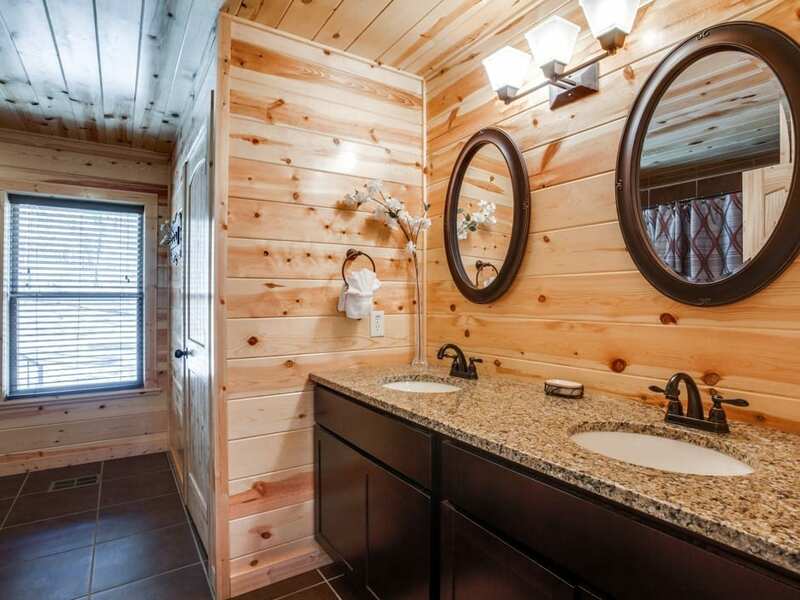 The attached bathroom has a double vanity, walk-in tiled shower and corner Jacuzzi tub. The Bedroom suite to the left of the living area also host a large Rustic style wood bed with king mattress wrapped in luxury linens. A 60″ HDTV is mounted on the wall for night time viewing. There are French doors leading to the back deck area. The bathroom attached to this bedroom can be accessed from the living area as well. 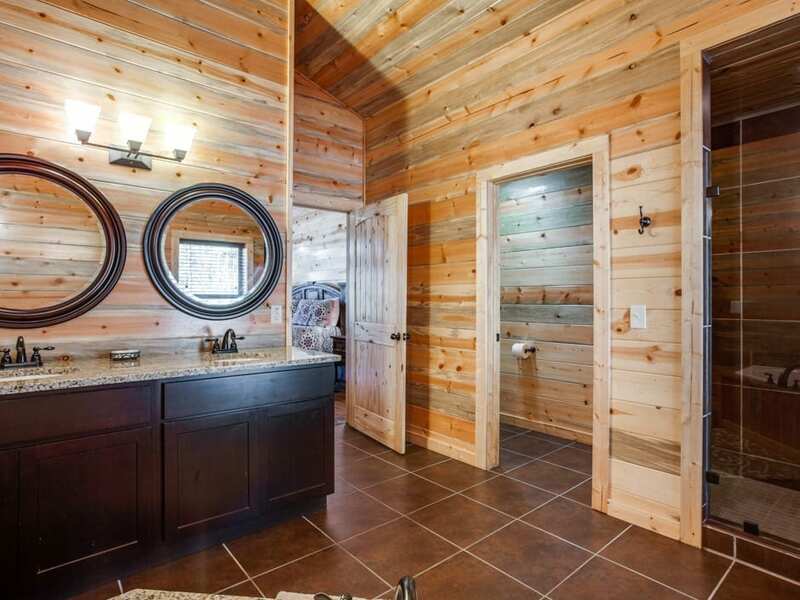 The bathroom has a double vanity and a shower tub combo. A laundry closet off of the living area has a full size washer and dryer for your convenience. 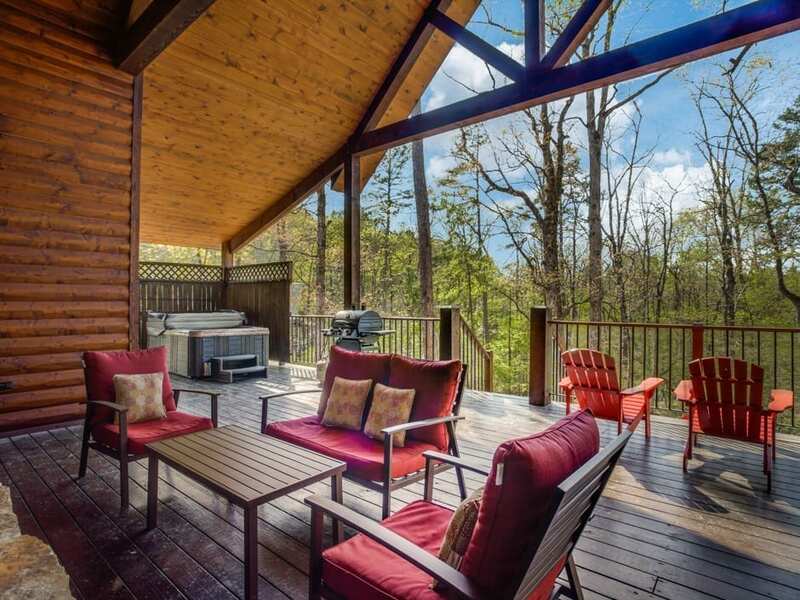 The back deck area has conversational seating in front of the gas burning fireplace. 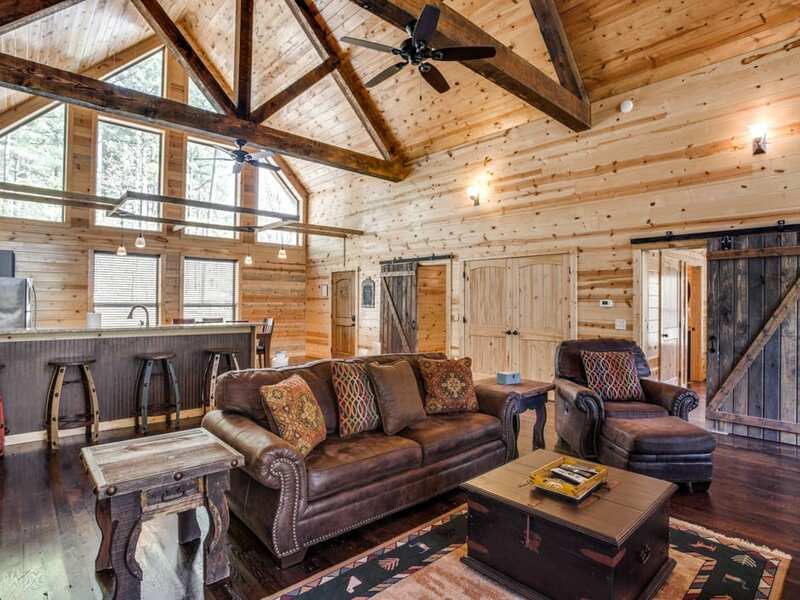 There is a 6 person hot tub to the left of the fireplace. A propane grill (propane provided) sits close by. Touch the clouds is just minutes from the Timber Creek Merchant shopping area where you can enjoy the local Restaurants and Gift Shops. 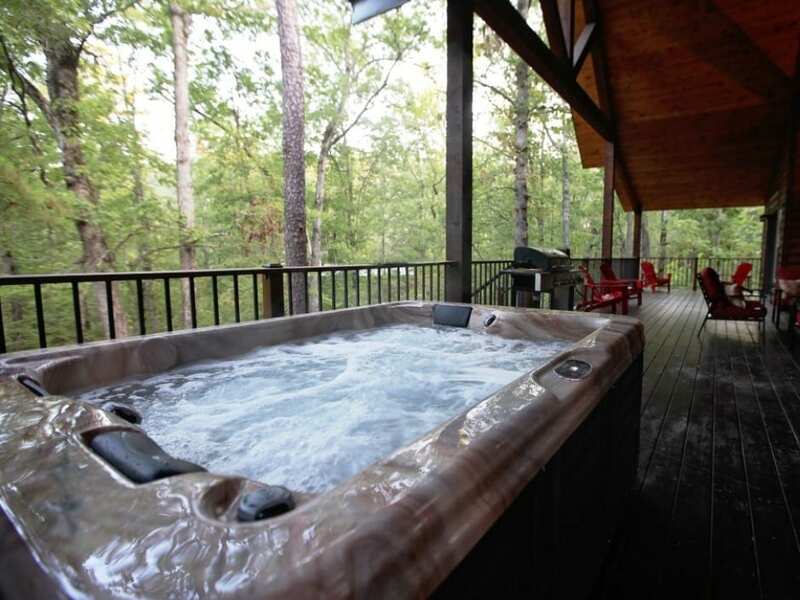 Beavers Bend State Park, Broken Bow Lake and Marina are approximately 5 miles back to the south on Hwy 259. Other local restaurants and entertainment attractions can be found there also.